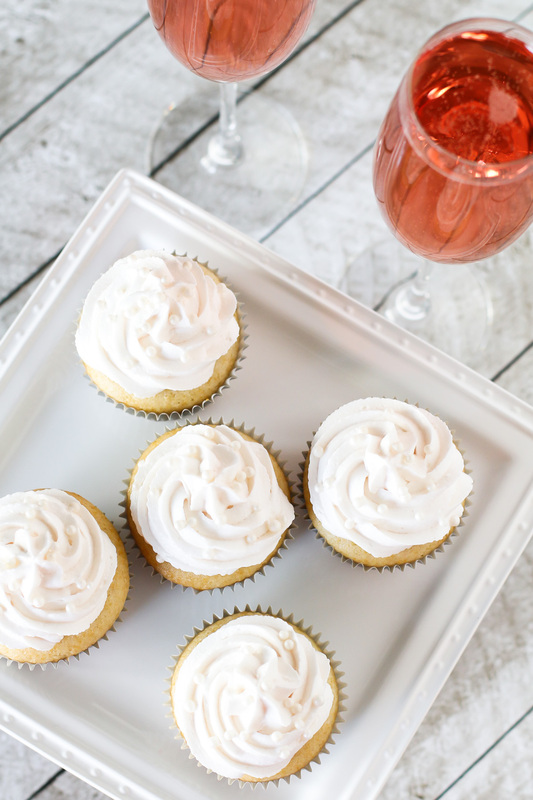 Celebrate the New Year with these gluten free vegan champagne cupcakes. Light vanilla cupcakes infused with champagne, topped with a champagne buttercream. Cheers! Champagne just so happens to be the most popular sparkly drink for New Year’s Eve. It’s very bubbly, a little fruity and best served chilled. Quite the delicious celebration drink. 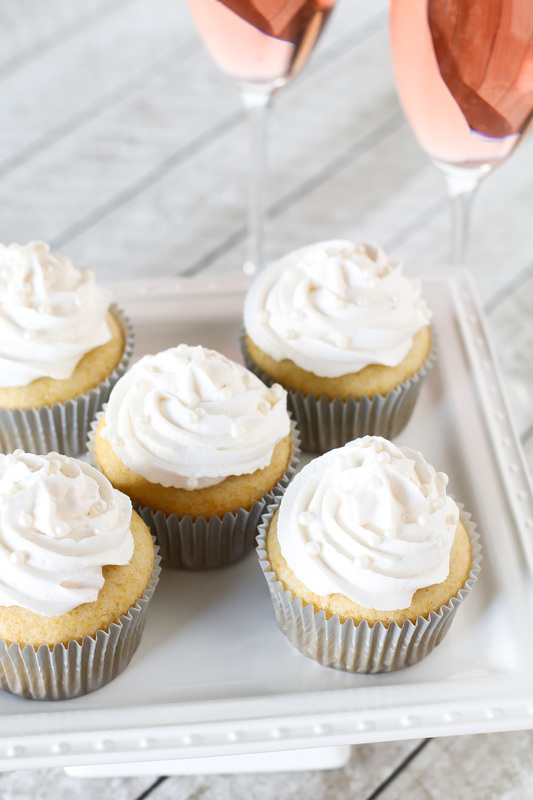 Now, onto these champagne cupcakes. I’ve added champagne to both the vanilla cupcakes, as well as the dairy free buttercream. It’s not overpowering, but just the right amount. I used pink champagne, but any champagne will work well. Use your favorite. If you would like to avoid adding alcohol, I would suggest trying an italian soda or flavored sparkling water to replace the champagne. I’m sure that would be lovely! I hope you all have a wonderful New Year’s! This is always a great time to reflect on the blessings of the past year, as well as looking forward to what lies ahead. 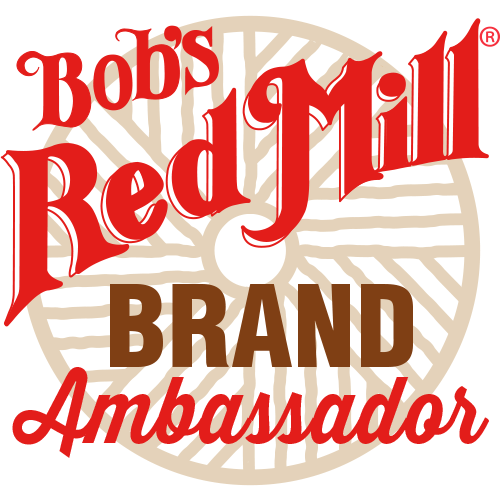 I’m already getting excited for the what’s in store for my family and for the blog too! Preheat oven to 350 degrees. Prepare cupcake pans by lining with paper liners. Mix coconut milk and vinegar in separate bowl. Add to flour mixture, along with champagne, oil and vanilla. Mix until well blended. Divide cupcake batter evenly into prepared cupcake pans. Bake for 18-22 minutes or until toothpick inserted in center comes out clean. Cool in pans for 5 minutes, then invert onto cooling rack to cool completely. To make champagne buttercream, cream shortening 1-2 minutes in large bowl of stand mixer. Add powdered sugar, champagne and vanilla extract. Beat until smooth and creamy, 2-3 minutes. Place buttercream in piping bag, fitted with large star tip. Pipe onto cooled cupcakes. Top with pearl sprinkles, if desired.